ALEX IWOBI. Remember the name. If any Arsenal supporters hadn’t previously heard of Alex Iwobi, his name would have been difficult to avoid this weekend after the youngster’s hat-trick for the U21s against Stoke City served to enhance his reputation. It wasn’t just the fact that Iwobi scored a hat-trick but the manner in which he took all three of his goals was hugely impressive and lent credence to the claim that, despite being deployed mainly on the flanks during his formative years at the club, the 18-year-old could have a future as a central striker. Following last night’s events, Iwobi now has six goals in 12 U21 games this season. The Lagos-born central striker, who is the nephew of former Bolton star Jay-Jay Okocha, can play on either wing and has the ability to unlock defences with his direct style and incisive passes. Alex captains the under-21 side and has represented England at under-16, 17 and 18 level. 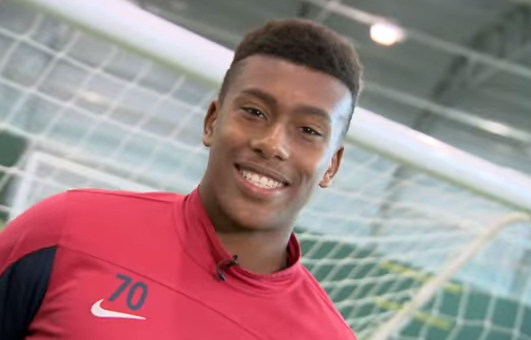 He signed his first professional contract with Arsenal in May 2014. “Jay Jay” Okocha. So good they named him twice. “The ambition is to break into the Arsenal first team plans and fulfil my ambition of playing at the top level on a regular basis,” he added. 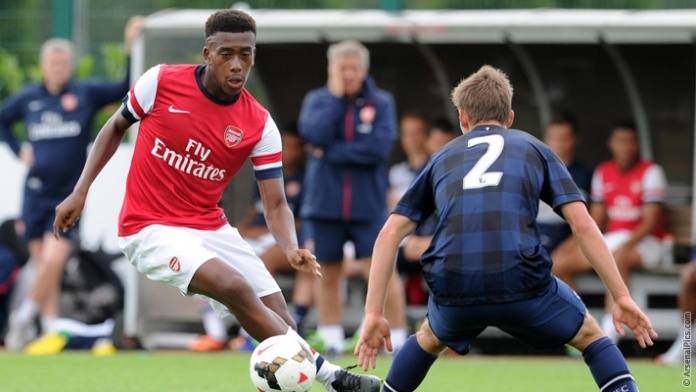 Iwobi will be seeking to continue his excellent form at U21 level. Chuba Akpom’s loan departure to Nottingham Forest has seen Iwobi ushered into a centre forward position and he has relished the chance that he has been given. Iwobi could also make his first-team debut in the near future. The Arsenal academy product has previously made the bench for the senior side in the Champions League and the Capital One Cup and has trained regularly with Arsene Wenger’s squad this campaign, which perhaps provides an explanation for why he was so at ease when playing with a selection of first-team players (Jack Wilshere, Abou Diaby, Mikel Arteta & Serge Gnabry) against Stoke. Alex has certainly been ‘expressing himself’ of late. Netting a double in a behind doors friendly against Brentford last week, before claiming his hat trick against Stoke during the week. Iwobi seems to have hit a rich vein of form at the business end of the season. Having seen the likes of Ainsley Maitland-Niles and Stefan O’Connor feature, albeit fleetingly, for the first-team, Iwobi will look to follow suit as soon as possible and, if he continues to perform like he did last night, he won’t have to wait too long for his opportunity.